My Technical Notes & Others...: How to Get Into Google AdSense with a Blog and Turn it Social? How to Get Into Google AdSense with a Blog and Turn it Social? This post offers a guideline to get into the AdSense program with a blog (and to avoid being kicked out). It also explains how to make it social by adding social buttons. First thing first, Blogger.com may not be the most trendy service on the net to create your own blog, but it has a very interesting feature regarding our objective: it is very well integrated with Google AdSense. So, start by creating an account on Blogger if you don't already have one. There are other ways to get into the AdSense program, for example, by creating your own website from scratch, and then request to join AdSense. Unfortunately, if you are new at web programming, there is high chance your website will not meet Google's quality requirements. Although you may successfully enter the AdSense program, you can be kicked out very quickly too. This is what happened to me. No warning from Google, little details about what was wrong. The whole account was shutdown. It had three URL which are now considered suspicious. Two were actually not infringing Google's quality requirements, according to the content of the notification I received. I solved those issues as well as possible. I tried to use the appeal process, and got an automatic rejection email rejection within less than 5 minutes. I tried to find help and answers on the official forums. Nada, no answer from Google other than not addressing the issues I raised. How responsible, accountable and adult is that? No dialogue... Fortunately, I managed to get into AdSense with this blog. Once you have a Blogger account, create your first blog. It is pointless to apply to AdSense program right away. You will be rejected. You need content first. How much? I failed with 13 posts and asked for estimation on forums. It was told at least 30. I got accepted with 21. But, I knew something that many people don't know. Someone found out that Google does not consider posts with less than 200-250 words valuable, though I could never official confirmation of this. All my post were above that limit. Write posts about something you are passionate about, and knowledgeable (for example: impressionist paintings). Make sure this is something interesting for your audience, because you will need traffic to stay within the Google AdSense program. If it is not interesting or relevant, people won't stick, people won't come back. You can create links between your posts if it is relevant and meaningful from a reader perspective only. Create traction will appealing content. In order to improve navigation in your blog, you can creates pages (not post) per topic (for example: Renoir, Matisse...) and make sure these contain links to each relevant page. You can make your blog searchable by adding the proper gadget from the template configuration page (see the bottom left of this page). I have also added the translation and rss gadgets. In order to turn your blog social, the best solution is to make it sharable using, for example, a service creating proper buttons for you. I have used ShareThis for the social buttons displayed automatically on the right of all my pages. To create such buttons, go to ShareThis. Click on more options. On step 1, select www. On step 2, select the Bar style (for example). On step 3, selects the buttons you would like to display on you blog. You are ready to go. When your blog contains 20-30 substantial posts, apply to the Google Adsense for the Earnings section. You may be not be accepted the first time. Just add more relevant content. 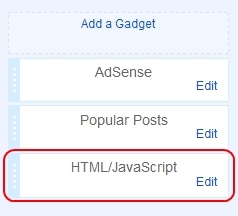 Once accepted, don't forget to add AdSense gadgets to your blog's template. More web related posts here.